Our gift boxes of Oranges from Valencia are designed so that you can give to your loved or give to their friends. 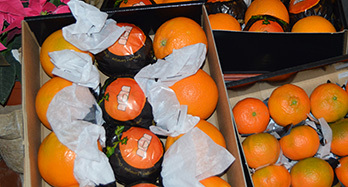 The box contains 4 gift boxes in total 45 oranges and 28 tangerines, part of them wrapped as formerly was carried out. The 4 gift boxes arrived you in perfect condition without any type of shot, since they will be inside another box much more resistant, so you can give away it without any kind of damage caused by transport. For those companies that wish to make a different Christmas gift to all the other, we perform shipping in large quantities and different points of Spain, you don't have to worry, we manage everything, including we customise your gift either individual or company. Shops or greengrocers do not pass unnoticed with this box for sale-exposed your customers, we supply within 24 hours and with a freshly-caught product of the tree without chemical treatments and each of our selected oranges one to one. For high quantity orders please contact. If you have already registered, please enter your e-mail address and password. If you are not registered click here.